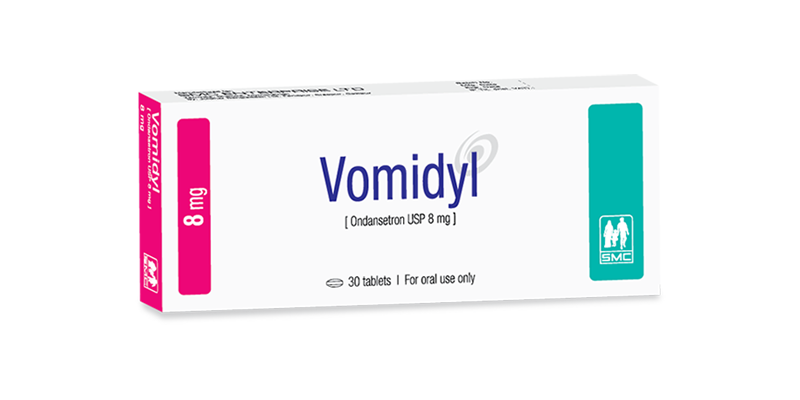 Vomidyl tablet: Each tablet contains Ondansetron Hydrochloride Dihydrate USP 9.976 mg equivalent to Ondansetron 8 mg.
Prevention of nausea and vomiting associated with initial and repeat courses of emetogenic cancer chemotherapy. Prevention and treatment of post-operative nausea and vomiting. Prevention of radiotherapy induced nausea and vomiting. Three 0.15 mg/kg doses, up to a maximum of 16 mg per dose. Initial Dose: 8 mg orally 1 to 2 hours before radiotherapy. Post Radiotherapy: 8 mg orally every 8 hours for up to 5 days after a course of treatment. Nursing Mothers: Ondansetron is excreted in the breast milk of rats. It is not known whether Ondansetron is excreted in human milk. Because many drugs are excreted in human milk, caution should be exercised when Ondansetron is administered to a nursing woman. Geriatric Use: Dose adjustment is not needed in patients over the age of 65. Hepatic impairment: A total daily dose of 8 mg should not be exceeded ( patients with severe hepatic impairment ). Renal Impairment: No dosage adjustment is recommended. Contraindicated in patients known to have hypersensitive to the drug or any of its components. • Concomitant use of apomorphine. The most common adverse reactions in Chemotherapy-induced nausea and vomiting (incidence 7%) are diarrhea, headache and fever. The most common adverse reactions postoperative nausea and vomiting in adults is headache (incidence 10%), and in pediatric patients aged 1 to 24 months is diarrhea (incidence 2%). The potential for clinically significant drug interactions with Ondansetron appears to be low. Vomidyl tablet: Each box contains 3x10’s tablet in blister pack.